As I exited my vehicle and glanced towards the woods, something white could be seen peering through the treetops. Night had fallen and it was now dark, and I could hear the screams pouring from the woods. An odd electricity seemed to flow from the darkness, energizing the groups of patrons leaving their cars and heading towards the woods. The crisp autumn air and the crunch of the leaves beneath my feet simply felt right. This was fall; this was Halloween; this was Haunted Overload. 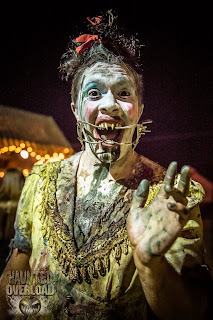 I've attended Haunted Overload for several years now, and the trek from Connecticut has become an annual tradition for my wife and I. The sheer spectacle of Haunted Overload has proven to possess something of an infectious allure, as a growing group of friends (eight as of 2013) now joins us for the annual journey. I couldn't quite make out the shape as our group moved towards the entrance, but something large was definitely looming in the woods, emitting an otherworldly white glow. Whatever it was, it was huge. This was hardly a surprise, as Haunted Overload mastermind Eric Lowther has been building up, literally, for years. From his humble beginnings staging a home haunt, Eric seemingly has a fascination with building big - monstrously big. It was clear that something new, and large, was in store for us this year. First, a bit of history. 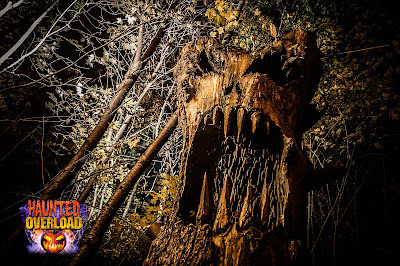 Following the 2009 haunt season, Haunted Overload relocated to its current home at DeMerritt Hill Farm in Lee, NH. In just one year, a whole new 45 minute trail was established in the woods aside the farm, a genuinely creepy setting for the haunt. That first year the new Haunted Overload felt complete (see my 2010 review here), but I did miss a few set pieces from the previous edition of the haunt. Although I've neglected to write anything new since that 2010 season, the crew at Haunted Overload have remained quite busy. 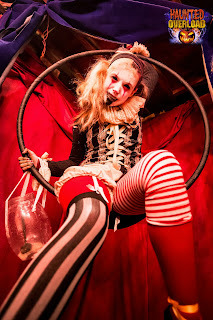 In 2011, old favorites made their return as new and improved versions of the circus tent and the vortex tunnel made their debuts. The new vortex tunnel is especially awe-inspiring, as patrons must pass through the vortex itself as they enter into the haunt. Not content to just establish parity, a whole new train yard section was added in 2012, as well as a new awe-inspiring structure. Known as the "cactus skull," and baring more than a passing resemblance to a devilish jack-o-lantern, the giant structure looms over the haunt. A humongous 36-foot tall clown was also added, dwarfing the already impressive circus tent. The haunt is designed such that the entrance consists of a series of cleverly designed queue lines. I say these lines are clever because the spectacle is such that the patron hardly realizes that they are waiting in line. 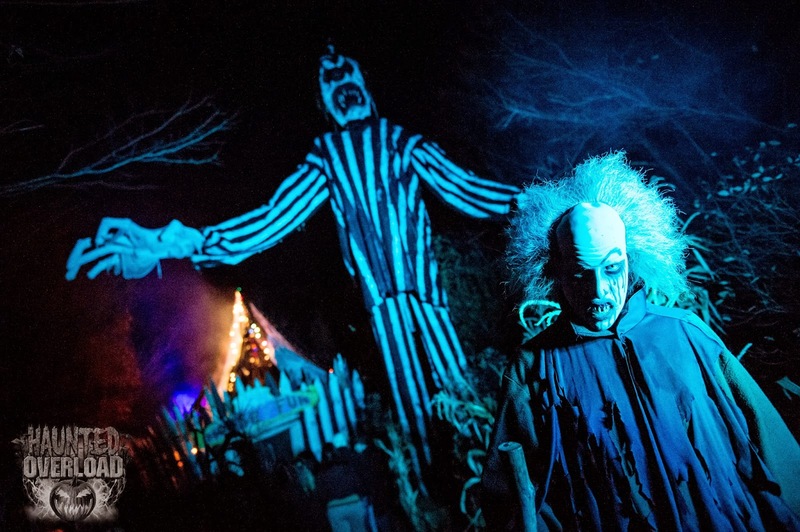 First, outside the woods, a line snakes alongside the ticket booth, the path dotted with ten-foot tall scarecrows. Keep a careful eye towards the hilly farmland and you'll catch a glimpse of the Headless Horseman riding about. Don't let your eyes wander too far though, or you risk being surprised by one of the monstrous actors creeping stealthily along the queue. As the line moves forward, you pass a highly detailed gypsy wagon and underneath a thirty-foot tall ghost (observant returning patrons may recognize the re-purposed giant witch). The trail continues between walls of aged wooden planks, and the patron arrives at the aforementioned vortex tunnel. This effect needs to be seen to be believed. Look at the picture below and then believe me when I say it looks even better in person! The vortex tunnel opens onto Halloween-incarnate, in the form of seemingly hundreds of creatively carved jack-o-lanterns doting what is affectionately known as Pumpkin Alley. 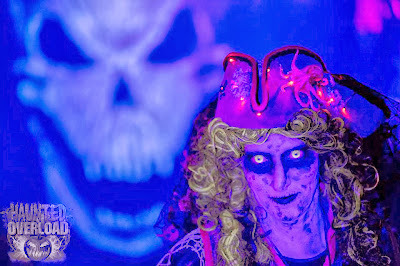 This is one of my favorite parts of Haunted Overload, and, believe it or not, you're not even in the haunt proper yet! More actors filter through the line, interacting and improvising with guests. A new wall breaks your line of sight about midway down Pumpkin Alley, punctuated with an eight-foot tall bird's nest, complete with the creepiest crow-man you'll ever see. You pass around the wall, and the newest giant set piece is revealed. This is what could be seen glowing from the parking lot - a thirty six-foot tall skull facade, flanked by two sixteen-foot tall skulls, clearly animal in origin. The skulls looms over you, angled as if it were going to fly straight at you. 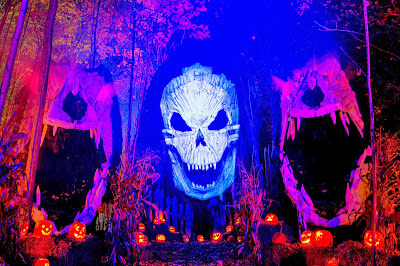 It is only here, as you pass underneath this glowing monstrosity, that you officially enter into Haunted Overload. The single word that best summarizes the additions made to the trail this year is density. At every turn, seemingly something new was placed along the trail, emphasizing the attention to detail. The early part of the trail still weaves through monstrous tree sculptures, another personal favorite. Impressive lightning effects crackle, casting ominous shadows across their ghastly, contorted faces. A new sound system pumps chilling sounds and creepy music throughout the woods with impressive clarity. I'm not sure I can recount all of the 2013 additions I noticed along the trail. Several new demon-esque facades appear along the trail, flickering with orange light. Two mausoleums, statues, and countless new headstones fill out the cemetery section. Several new 12-foot tall Reapers ominously guide you along the trail. A spooky jack-in-the-box and second vortex tunnel were added to the clown section. New lighting and fog effects enhance the already impressive giant "cactus skull." I'm surely leaving out several other notable pieces. Having been housed at DeMeritt Hill Farm for several years, the benefits of a stable home are truly beginning to bloom. 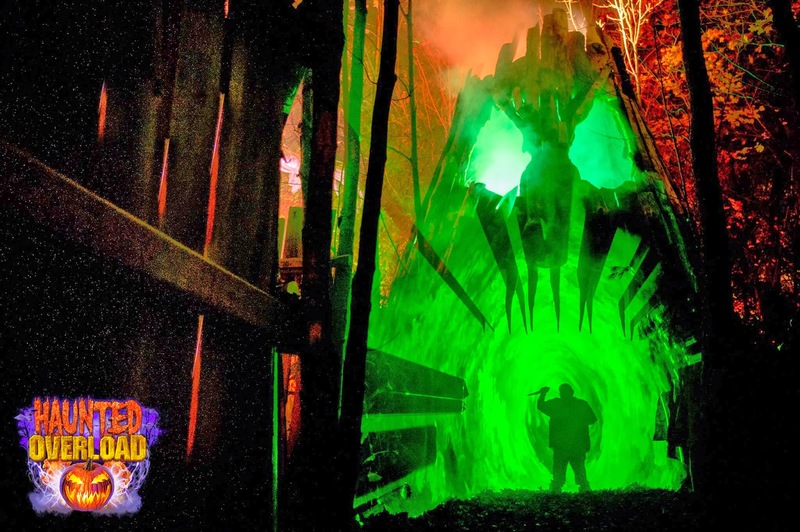 It is clear that Haunted Overload's trademark giant structures were only the beginning, and that the trail will only continue to be fleshed out in the future. Beyond the craftsmanship of the set pieces, costumes and makeup continue to be of the highest quality. The actors populating the queue lines in particular are all adorned with movie or theater-quality costumes and props. Some of these may be credited to an extremely talented costume manager, and many others are made by the actors themselves. All of the actors at Haunted Overload should be extremely proud of the quality they put on display. The performances themselves are also top notch. A good mixture of screams, whispers, and guttural, animalistic sounds keeps patrons on edge. Combined with the new sound system, a spooky atmosphere is maintained at all times. The sheer number of volunteers populating the trail this year was also fantastic; I didn't see a single unoccupied corner or monster closet. Despite this, many actors showed restraint, working together to misdirect patrons and to really deliver the scares. Every haunt should be as lucky to have so many talented volunteers. Fantastic performances all around. 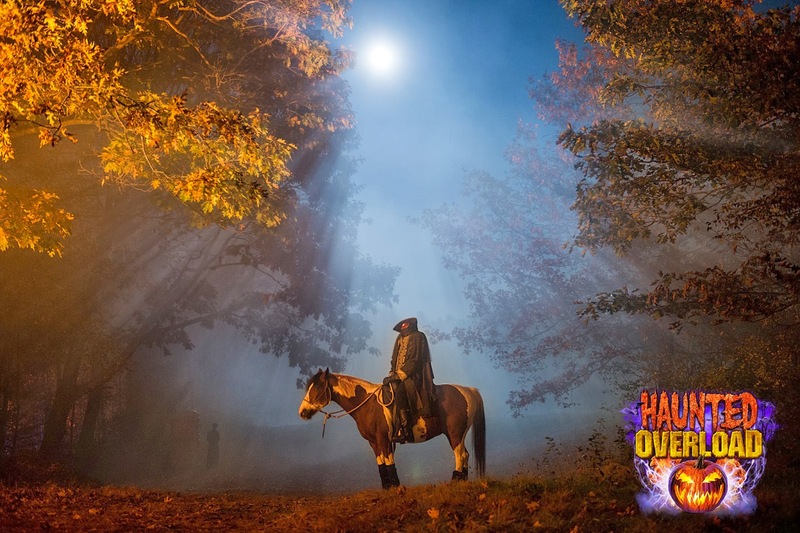 With every passing year, I feel a mounting excitement to see firsthand the newest additions to the haunted trail. With the consistently amazing display at Haunted Overload, it becomes almost easy to take the skilled craftsmanship for granted. As eager as I can be to see the newest additions, I try to keep in mind that these accomplishments are achieved only through the hard work and dedication of a handful of incredibly talented and passionate volunteers. Even with this mindfulness about me, I find myself once again totally blown away. Necrotia bids a fond farewell. Come back soon! 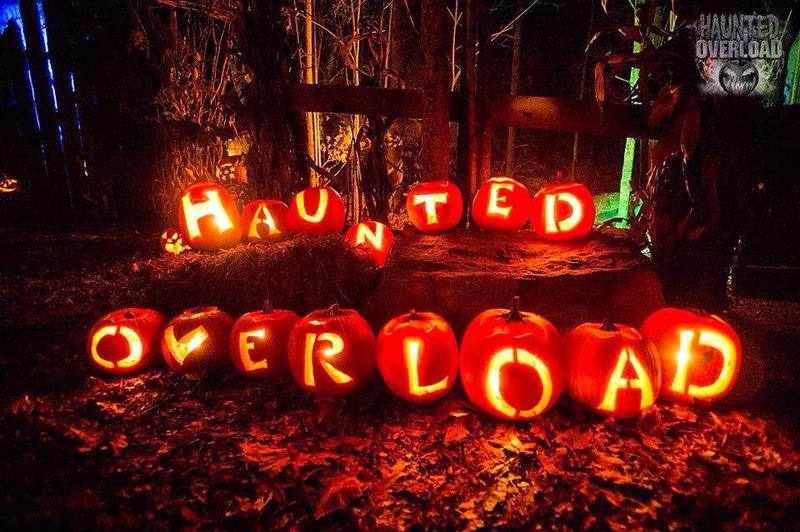 Haunted Overload simply has to be seen to be believed. No one else in the haunt industry is building on the same scale as Eric, Walley, Tom, and the rest of the crew at Haunted Overload. The gigantic structures prove that these folks are positively certifiable (I mean this in the best way possible). The attraction is bolstered through the hard work of countless others, from the workers at the farm store, the ticket takers, to the folks directing traffic in the parking lot. From Beth, the chainsaw wielding maniac, to Tickles, the demented circus ringleader, every patron is guaranteed the fright of their lives! Haunted Overload is located at DeMeritt Hill Farm at 66 Lee Road in Lee, NH. The farm has a variety of other activities during the day, so parents be sure to check out their website for hours and other information. Tickets for day time walks through the Haunted Overload trail can be purchased in the farm store for $5, and I highly recommend it if you want to be able to stroll through the haunt and really appreciate the finer details. There are only a few shows left this season, so get online and buy tickets now! I have been a fan of theirs for years and am going there tonight for the first time. This wonderful write up has me pumped! As if I wasn't already! They inspire me greatly! My favorite part of this review was this description - The Haunted Overload possess an infectious allure! I have never been there but it is on the top of my bucket list to go. I have been following them for years and they are so inspiring. They are the reason I searched for our own property with land so we can do something like this. Thank you for this great review. I really enjoyed it. @Mary..."infectious allure" is so true. That place is crawlin with lime disease.